To the Carpathians and beyond. It was just after dawn on a gloomy Sunday morning, the streets of Bucharest were deserted and I was alone in the back of a speeding taxi, the driver a madman. I had done the proper thing and asked the hotel to call me a taxi from a reputable company. Nothing could go wrong I had assured myself. The driver turned up at the hotel less than two minutes later, unshaven, brash and wearing a stained white vest and dirty tracksuit bottoms, he looked like he had literally just rolled out of bed. I glanced nervously at the cab number as I got into the back. – “Taxi 64x, remember 64x!” I whispered to myself. I had an uneasy feeling in my stomach. I had already made up my mind I was either going to throw money at him while fleeing the taxi at the first red stoplight or even worse i’d need his cab number when filing a complaint. I wanted to go west towards the bus station but before I knew what was happening we were rambling down vacant alleyways and around tidy squares before heading north towards Piata Romana. – “Is it your first time ee the city?” he asked while glancing expectantly in his rear view mirror. It was early, I was in an unfamiliar country and I had heard the same question from taxi drivers the world over. I’d learned my lesson never to admit you were new to a place. Arriving in New York alone and wide-eyed aged 19, instead of getting out the cab on the Upper East Side I had ended up in a grafitti-scarred, bombed out neighbourhood somewhere in Harlem where some poor soul was eating out of a trashcan. Still, now in Bucharest it was a Sunday, I was half asleep and didn’t have enough brain cells even to think about being tactful. – “Yes, it’s my first time in Bucharest” I answered “and by the way, can you drive along Regina Elisabeta Boulevard instead? That is the quickest way to Autogara Militari! ” I smirked. He threw his head back and laughed uncontrollably before turning round and looking me straight in the eye. – “What? You leeve ee Bucuresti? You are knowing driving ee Bucuresti?” He demanded. I told him I didn’t want to play any games and that we had to cross the city in three minutes as my bus was leaving. He told me I would never make it and that he would drive me anywhere for a good price and anyway, since I was his first customer of the day I must bring him good luck. I told him to step on the gas. I think he liked that as before I knew it we were racing along an endless boulevard, Avenue Foch maybe, but all wrong, on both sides lego shoebox-like high-rise apartments, weather-beaten and neglected as if someone had carelessly spilled grey paint all over them. Now and again we’d overtake the odd, solemn car and jump red traffic lights. At the bus station I complimented him on his driving skills before running into the autogara. As I ran along the docking station my heart sank, it was empty, I was too late. – “My friend! Run! Your bus ee outside!” I turned around to see the taxi driver running after me. He had managed to flag down my bus which was now outside the bus station ready to turn onto a main road. The taxi driver grabbed my suitcase and we made a mad dash for the bus. Inside I tried to give the bus driver money for the journey but he just signalled me to go sit down. Romania, I realised, was strange, but in a good way. The bus travelled through the flat plains of Wallachia. The low horizon reminded me alot of home only now trees seemed a darker shade. Not an intense, bright green like in Holland. Agricultural land borders didn’t seem as regimented. I marvelled when I noticed people working in a field using a horse and cart. I thought such sights would only have been saved for somewhere rural, not on the capital’s citylimits! It was pouring outside, raindrops drizzled across the window giving the landscape a blotted softer feel. If the driver hadn’t been blaring Romanian pop music through the speakers i’m sure I could have slept, the swaying of the bus made me feel like a baby in a cradle. After a few hours we stopped in a cheerless, modern town. Dark silhouettes huddled in shelters out of the rain, the cloud of obligatory cigarette smoke working it’s way over their heads. Two street dogs would now and again run aggressively through the bus station barking at no one in particular, the type of dogs who would scatter the moment you barked back at them. I tried to decypher the advertising billboards and with my smattering of European languages realised it was not so difficult. One offered free bus travel for the handicapped but mostly they were special offers to places like Germany, France and England. It seemed there was an exodus by bus going on although I had the feeling these weren’t travel agencies for holidaymakers but for people looking to start a new life elsewhere. Later the bus started to climb into the valleys of the southern Carpathians following the Olt Defile, it’s dangerous road hemmed in between steep cliffs and the cinnamon coloured Olt River. I realised I had been right to travel by bus. The views were better travelling through this gorge everyone had told me, for centuries an important trade route and once the eastern frontier of Roman Dacia. By train the views were supposed to have been uninspiring. The reason I had originally avoided going by train was because I was told that Bucharest’s main train station Gara de Nord was full of thieves and drug addicts although found out later this was not true. In the mountains suddenly Romania had become a fascinating, otherworldly place. Every bend in the river would reveal soaring, almost gothic, peaks hugged by equally imposing black clouds. The further we climbed the more the weather improved. As the bus raced through likable villages I noticed an old woman wearing a pretty headscarf stooped over and lovingly tending a grave. Further along stocky, rural people were standing beside rickety wooden stalls selling tempting watermelons and goats cheese. In one village a child ran towards and pointed excitedly at a geranium that had fallen from a plant pot. Ancient, defensive stone churches and monasteries would appear balancing precariously on the river bank. Some passengers on the bus would bless themselves, crossing themselves a number of times whenever we passed a holy place. Later the exhausted bus stopped by the roadside and a frail old woman dressed in a black headscarf and simple clothes was helped down the stairs and along a path towards a monastery. I had the feeling getting there had been a major undertaking for her and sadly this journey was for her in some way final. Once we crossed the mountain range and into Sibiu County the landscape seemed like a blanket that had just been shaken ever so slightly creating green rolling hills fading off into the distance. The villages and towns were completely different now. Gone were the narrow pointed triangular roofs and wellkept gardens. These houses were large, imposing and made of stone topped off with hipped gable roofs. Instead of driveways these houses had broad wooden doors leading to inner courtyards, the type of doors you would imagine fit for a horse and carriage. The bus had arrived in an area which had been inhabited by the Saxons, a people from northern Europe who spoke German in a crude Lëtzebuergesch dialect. We were now in the historical region of Transylvania. Walking across Sibiu’s main square for the first time. The bus pulled into my destination, once capital of the Principality of Transylvania, Sibiu. I felt excited, I had wanted to visit this elegant town for over a decade although the moment had never been right. It was still midmorning and I began to wander the streets carrying my suitcase towards my hotel. 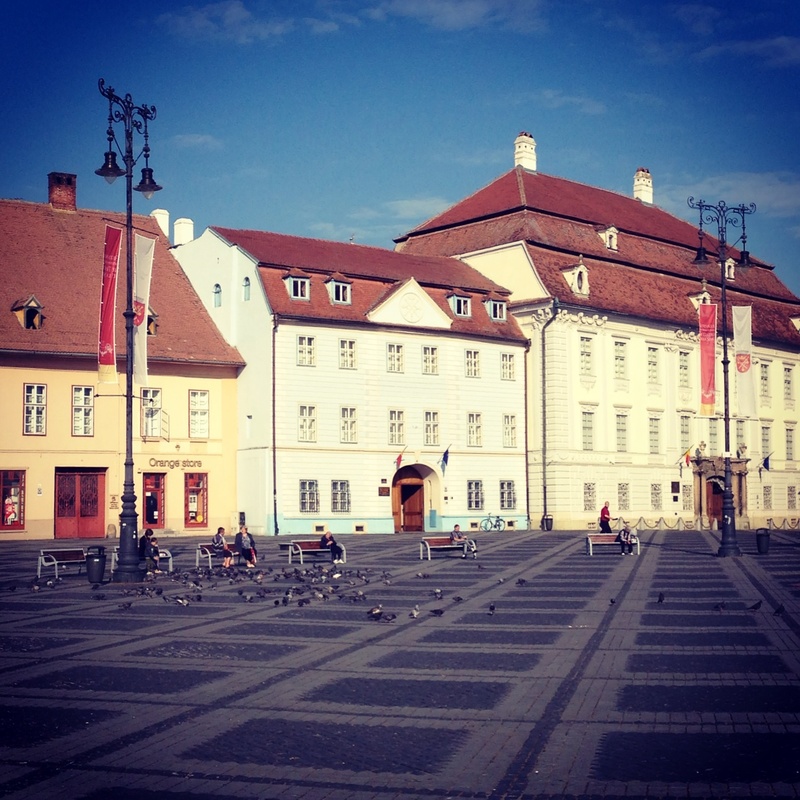 For my arrival Sibiu seemed to greet me with crisp air, the ringing of church bells and endless blue skies. I walked up a meandering cobbled street and passed the 15th century Church of the Ursulines where it’s smartly dressed congregation was slowly seeping back into the street. 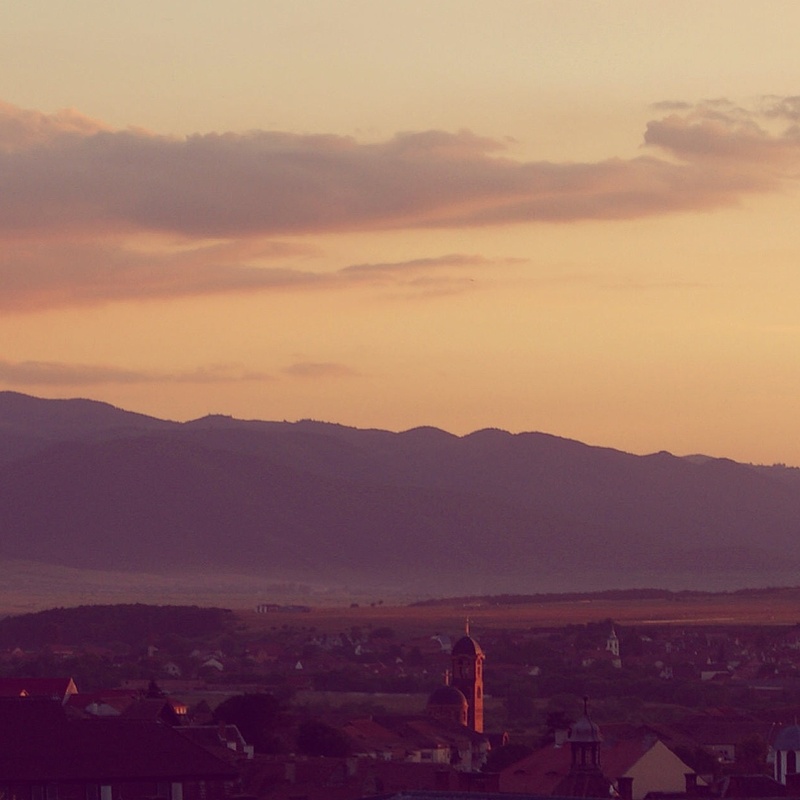 Sibiu felt different, almost faraway and noble but still the type of town where people knew each other. After I got to my hotel room and unpacked I lay on the bed staring up at the ceiling thinking of the journey across the Carpathians, how encaptivating it all had seemed. I realised that this country, Romania, could in some way be taking possession of my heart just as it had done with many other travellers who thought they were just simply passing through. This entry was posted in Romania and tagged Bucharest, Bucuresti, Church of the Ursulines, Dacia, Olt Defile, Olt River, Piata Romana, Romania, Saxon, Sibiu, Transylvania. Bookmark the permalink. Yes Romania was a fantastic country to travel around, one of my favorites, I will be sure to visit your blog for ideas on where I should visit next time. Regards! Compliments on coming from such a lovely country!